Melanie is very upset about the break- up with Roger and cries to Matt that she really loved him. 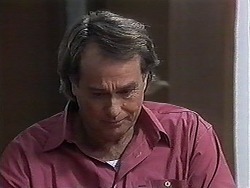 Matt comforts her, saying Roger just wasn't the right man. MELANIE: I feel like my whole world has come apart! Matt says he does understand - he's had a heartbreak too lately, but he's not going to jump off a bridge and he doesn't think Melanie should either! She shouldn't let Roger ruin her life. Melanie agrees that he's right. 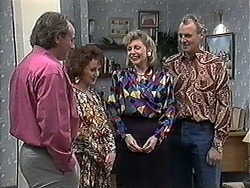 Des comes in and tells them casually that he's sold the house. Matt and Melanie just look at him. MELANIE: What a rotten day! Now I'm being evicted! She runs off to her room, crying. 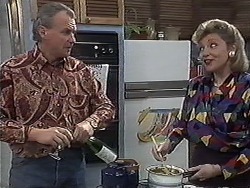 Matt explains to Des about Melanie calling off the wedding to Roger. Des says that Melanie is the sort of person that needs to care for someone and Matt suddenly looks thoughtful. 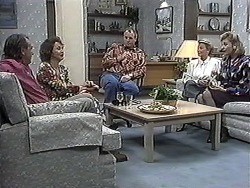 Beverly tells Helen that she's invited Doug and Pam Willis to dinner tonight. Jim isn't very happy about it! 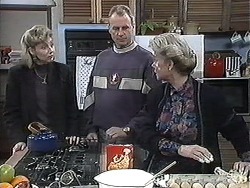 Matt is telling Gemma and Madge that Des is selling the house. Matt doesn't know where he's going to live yet. He tells Gemma that he'll bring her tapes around later and she agrees. 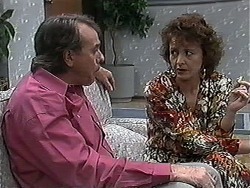 Des tells Melanie that he's really sorry about Roger and the break- up. Melanie is trying to pick herself up. Des says sometimes it can take a long time to find someone, but it's worth it in the end. Melanie has a lot to look forward to. Doug arrives and introduces his wife, Pam. She thanks Beverly for her hospitality and they sit down in the living room. 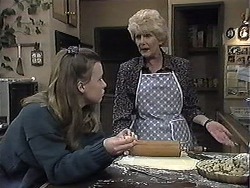 In the kitchen Beverly suggests that Helen goes in and introduces herself. Meanwhile, Doug is giving Pam a rundown on the Robinson family! In the kitchen, Jim tells Beverly not to bring up the camping trip, while in the living room, Doug suggests that Pam thanks Jim for the fish they brought back from the camping trip, as a means of breaking the ice(!) He always warns Pam not to talk about the kids. PAM: I think an egg on a piece of toast at home would have been easier! Jim, Doug, Pam, Helen and Beverly for chatting amicably. Apparently Pam met Doug when she was driving a cab! She thanks Jim for the camping trip and Jim glowers and goes off to the kitchen. Beverly then brings up the kids and Doug and Pam avoid the subject. They talk about how Beverly and Jim met and she admit she was called in to remove a splinter of metal from his bum after an engineering accident! They laugh raucously, but ask them not to mention it to Jim! JIM:(bringing beer back from the kitchen) I'm not sure if this is cold enough, I'm having a few troubles with our fridge. Bit of a bummer, really. They all laugh raucously again, much to Jim's surprise! Matt has given Melanie one of Joe's kittens and she loves it. Des warns her that having a pet might make it hard to find another flat though. Matt tells Des that he's upset about his relationship with Gemma - he tried to talk to her, but she wasn't having any of it. 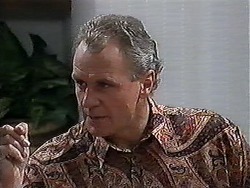 Des advises him to give Gemma some time. Melanie has decided to call the kitten Trev - "Terrific Trev". 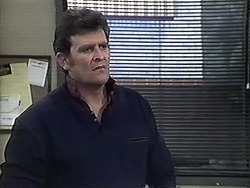 Madge is ranting about Paul expecting her to mind more class acts for The Waterhole - Darryl Cotton was a fluke. Gemma is brooding about Matt and asks Madge if he looked a bit hurt or seemed a bit quiet earlier. Madge is too busy ranting about Paul though! MADGE: At this rate I'll have to take up sword- swallowing and book myself for the night! Beverly, Jim, Doug, Pam and Helen are having dinner now. 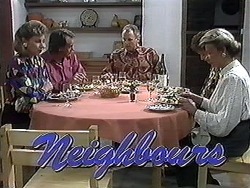 Pam asks about Ramsay Street and what it's like to live there. 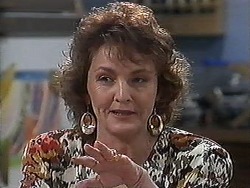 Helen explains that Madge next door is on the council. Jim tells them that earlier this year the council tried to form a "splinter group" but it's all OK now. At the word "splinter", Pam and Doug try not to laugh. Helen quickly says that it'll be nice for Todd to have Cody next door, but Jim's not too sure if Scott and Charlene are anything to go by! He thinks they should learn from that experience and set a few ground rules for Todd and Cody right from the start. Doug says it'll be great to have a doctor next door too! He'll try to come up with a suitable complaint! Matt has popped around to return Gemma's tapes. 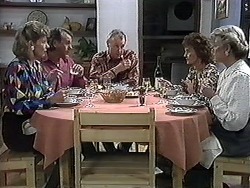 Madge invites him to join them for desert, but he has to go and look through the paper for a flat. He's thinking of moving closer to the city. Gemma says that parking might be a problem, but Matt says maybe he'll be able to improve his social life to make up for it. When Matt has gone, Gemma states that Matt is so smug now. Madge reminds her that she was the one who dumped Matt! MADGE: You're not changing your mind, are you? GEMMA: Of course not! I couldn't care less what he does or where he lives. It's got nothing to do with me.